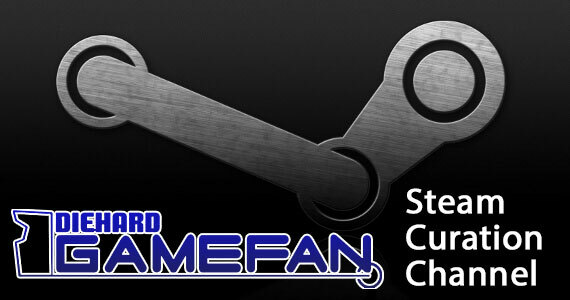 So I will start off this review right away with a clarification. I am FAR from being an expert painter. 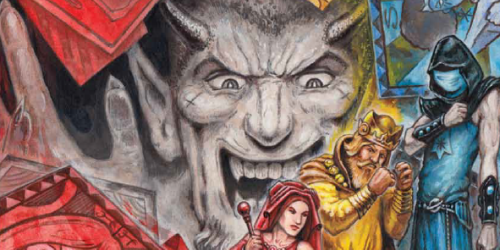 I will never win a Golden Demon and I just starting painting miniatures this year. To top it off I have no sense of touch in my finger tips and ulnar nerve damage in both hands from years of working out, martial arts and writing tabletop products (and reviews) since I was a junior in high school (I’m very old now), so my paint jobs are not going to be amazing by any stretch of the imagination. I paint because it is fun, very relaxing, a fine alternative to video games (especially these days) and it helps get some of my fine motor skills back. 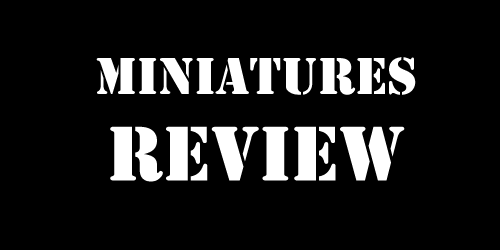 That said, let’s review this puppy! 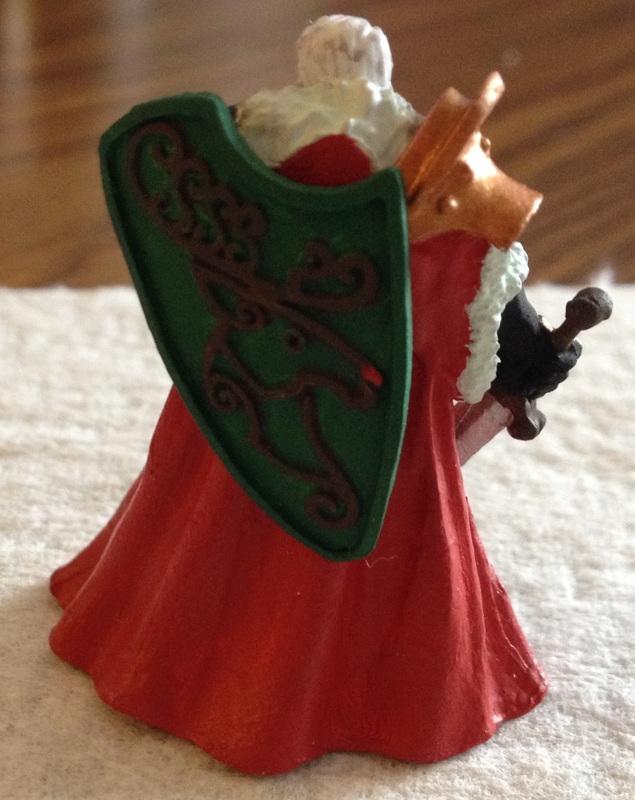 Christmas Knight is a limited edition miniature crafted for the 2014 Holiday Season. With a price tag of $9.99, it’s a bit pricer than the usual Dark Heaven Legends figures with generally run between 5-7 dollars. This is because DHL figures are metal as opposed to resin, restic, plastic or the material Reaper’s own Bones line are made out of. However, I loved the design of this figure and I really wanted to paint him (even though I don’t celebrate Christmas). I just like the design and thought he would be a lot of fun to paint. Turns out I was right. 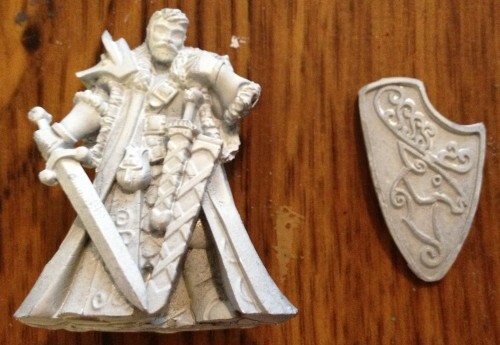 Here is Christmas Knight primed with some Skull White spraypaint from Games Workshop. He came in two pieces which meant I would have to glue them together. This is my first actual metal miniature that I have painted since college (The Red Duke and some Bretonnians in College). Although I’ve painted fifty some figures this year including the Garden of Morr for Warhammer and the giant Great Cthulhu from Bones, I was a bit nervous doing a metal piece, especially a limited edition expensive one like this. I also have bad memories of gluing metal figures together. 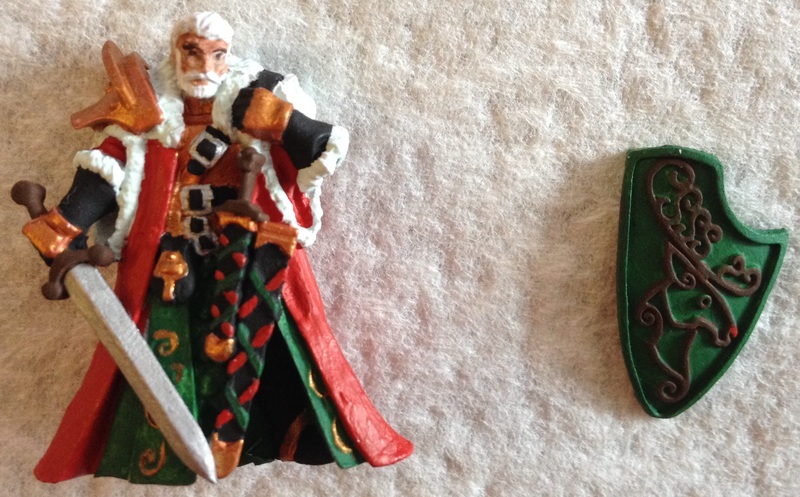 Heck even this year gluing metal/plastic combinations like a Tomb King on a Chariot was annoying enough. Metal on metal was not going to be fun. Thankfully, Reaper made it easy with this sculpt. What you can’t see is that on the back of the Knight, there are little holes to press the shield into, making it stay on when the glue finally sets. I was surprised that the figure didn’t come with a base, but he’s thick enough that he can stand up on his own. 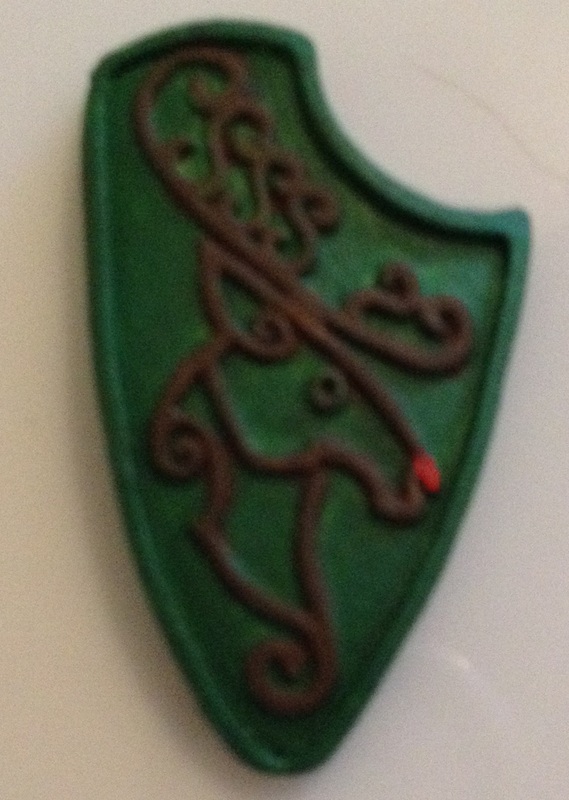 I was also surprised, but in a happy delightful sort of way, that the Knight’s shield had a Reindeer on it. That was not advertised and that made it all the more enjoyable to paint. First up is the painted shield in progress. I used only three main colors for this. 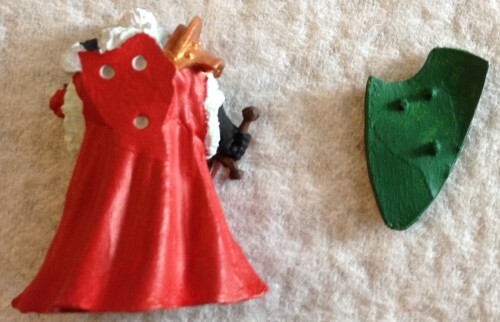 Reaper’s Grass Green for the core shield color and Muddy Brown for the Reindeer. I also used Citadel’s Evil Sunz Scarlet for the nose. I decided to make the Reindeer extra Christmas-y and go for Rudolph. I painted the shield first and then drybrushed the brown on. Since the Reindeer image is actually raised up from the shield instead of embedded into the design, it was really easy to dry brush this. Then it was just a dab of red for the nose. You can see in this process shot that the green is really uneven and this is a reason I tend to use Citadel or Mantic’s paints over Reapers. Reaper paints tend to be really runny and watered down, making it hard to paint evenly with one coat. So I had to do two or three turns with the green. I never have that problem with Citadel paints, but they do dry out a lot faster so…checks and balances. I tried to do this in all Reaper paints, but I just couldn’t find a Reaper red that was this bright and still felt Christmas-y. Here is the Christmas Knight in progress. He’s far from finished here, but you get the idea of how he is going to turn out. 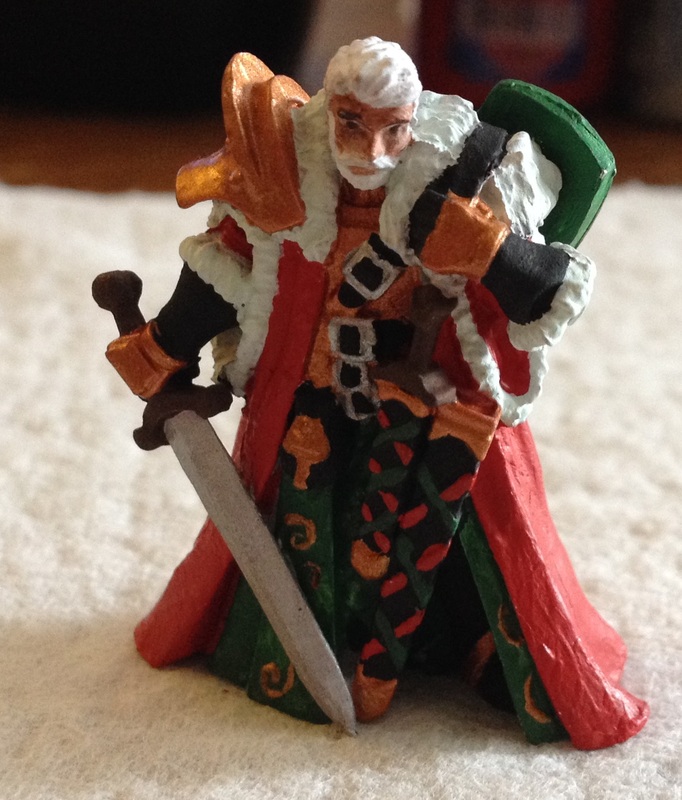 At this point the white parts are still unpainted but you can tell I’m going for a Santa motif color-scheme wise. One thing I learned from doing a metal figure after all this time is that HOLY HELL DOES THE PAINT FLAKE/COME OFF THESE GUYS SO MUCH EASIER. I can’t tell you how many touch ups I had to do from just touching this guy and having paint come off him, even with a sprayed on basecoat. Even in this picture you can see where bits of flaked off, like on the pouch. You can also tell I simply cannot do eyes. I try painting the white parts and then adding a pupil, but it never looks good. I can’t do the white part of eyes at all and don’t even get me started on trying to do eyeliner for female figures. Oh man, this is where I would kill for a normal pair of hands. I might have to make a deal with the robot devil at some point for his. Still, you can see where I’m going with Christmas Knight at this point, flecks, touch ups and all being needed. I’m really liking how he is looking at this point, especially the skin tone since I was going for a windburn coloration. Here’s essentially the final version of both (found a few bits of that damned green and tiny flakes that needed touching up). The sculpt was really well done and even the tiny little swirls on the inlay of the outfit bottom were easy for me to do. Only the eyes gave me a real problem in terms of reaching/painting, but that’s with most human faces, which is why I tend to do monsters or people with helms. I’ve only been happy with the eyes that I’ve done twice – both wizards. I’m extremely happy with how the shield came out and the white parts on the Knight. I used eleven different paints on this figure – eight Reaper and three Citadel. The Citadel paints were Evil Sunz Scarlet, Runefang Steel (The most commonly used paint in my home), and Ghenna’s Gold. I decided to paint the armour parts gold to keep in with the Christmas theme. After all, Frankincense and Myrrh armors aren’t really possible. The Reaper paints I used were Pure Black, Grass Green, Muddy Brown, Pure White (for the beard), Vampiric Shadow (drybrush) for the hair, Maggot White (for the fur of the robe to make it stand out from the facial hair and to make it seem a bit dirty), Fair Skin and Flesh Wash. All in all, I’m happy with how this turned out, especially as a new painter and for someone who pretty much has to hold a paint brush the same way I hold a butcher knife. The back of the figure. 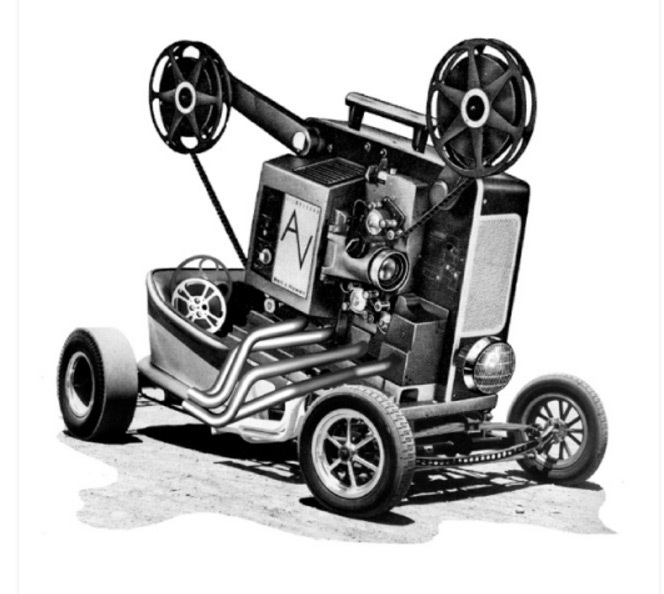 The final version, all assembled. No actual metal on metal gluing nightmares here for once! The back of the Knight who I have decided to name Pierre Noel (Terrible pun, I know). I definitely feel Christmas Knight was worth the ten dollar price tag. 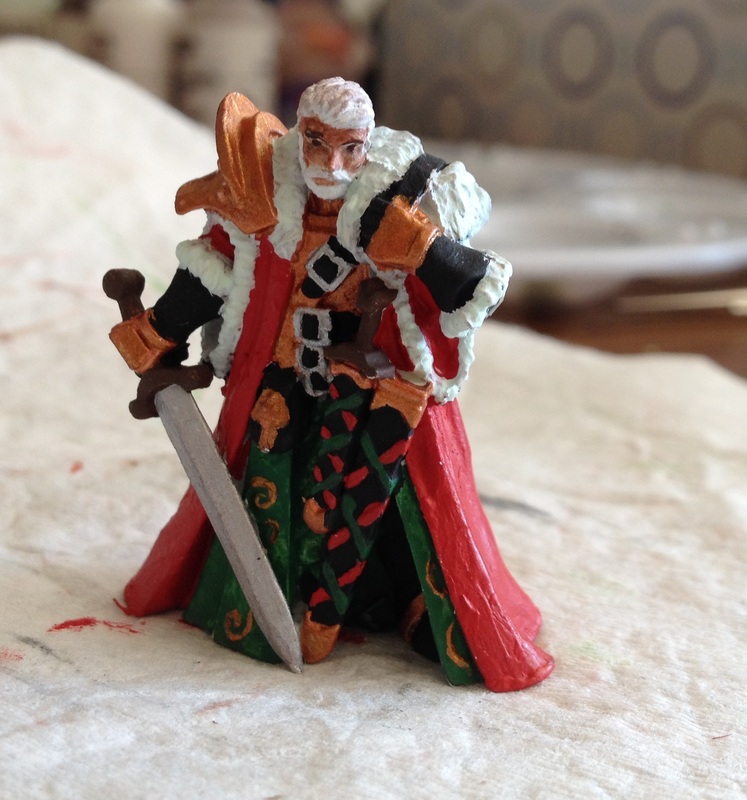 I made him for my wife who is a big Christmas fan and I’m looking forward to painting Christmas Eve (His female equivalent), the Christmas Familiars and Christmas Elf too to have a whole Christmas theme adventure party to field. Maybe I’ll even get the Krampus and murderous Snowmen figures Reaper made and let my wife make a dungeon with our Dwarven Forge tiles for them all.